in front of the central station in Frankfurt/Main. The four teenagers were part of a group comprising six underages, who were caught as they tried to escape crossing the border to Ethiopia. Soldiers fired at them. One of them managed to escape to Ethiopia. The remaining teenagers went back and hid, but surrendered to the soldiers at last. They passed on their student papers and told that they were from neighbouring villages. Nevertheless soldiers opened fire and shot the remaining five teenagers. Goitom Solomon, Kiros Haile, Tesfai Debessai and Mengistu Gergis were killed. Tekeste Woldai was slightly wounded, could escape later and reported about the incident. Eritrea is taking action heavily against runaways evading the draft or trying to desert. All men and women,too, from 18 years on, are liable to military service. Regularly military service will be prolonged indefinitely. Deserters and conscientious objectors are arrested unlimited and are being held in solitary confinement. Some Jehovah Witnesses have been in jail for about 15 years. There are estimations that only in the first two months this year some thousands left the country to ask for shelter in other countries. 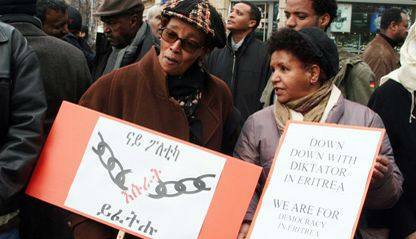 "Political repression has increased extensively in recent years", the Eritrean Democratic Alliance wrote in their call for the demonstration and funeral march next Saturday. "Many people opposing the regime and political opponents are arrested at secret places and isolated. Nobody was tried, charged or sentenced. A growing number of Eritreans only see the chance to escape." Connection e.V. : press release, February 25, 2009.